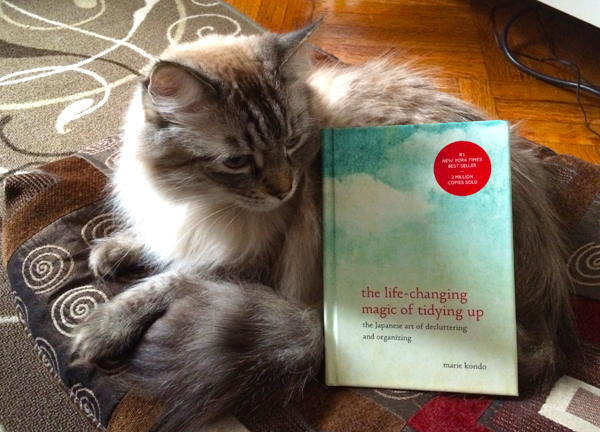 This little book has made quite the mark in the self-help/home organization genre. Written by Japanese cleaning consultant, Marie Kondo, The Life-Changing Magic of Tidying Up is infinitely better than the usual drivel that comes out of this section: How to organize your closet with fancy shoe racks! How to classify that pesky bathroom drawer! Why you need a separate knife for each kind of cheese! I’m not sure about the life-changing part as I’ve yet to do a full organizational sweep as the Kondo suggests, but the book is filled with a solid amount of Oprah ‘a-ha!’ moments. Kondo goes against conventional wisdom to propose a fresh, wholesome way of eliminating extraneous possessions, simplifying the home, and helping her readers to live a more comfortable, peaceful life. Kondo has branded her program the KonMari Method after her name. It is clear that she has been passionate about cleaning and organization since she was very young, and has thoughtfully and comprehensively considered both tidying and human behavior while composing her method. So Kondo doesn’t exactly use the word ‘ruthless’ but that’s how it resonated with me. This is a crucial part of the KonMari Method and the key to its success: discard, then store. That sweater that you thought you loved in the store but actually fits you poorly? Gone. But you feel guilty you bought it? Doesn’t matter, throw it out. But you were with your Grandma when you bought it and she told you how much she loved it and everyone knows how sentimental you get with anything involving your Grandma? GET RID OF THE DAMN SWEATER. The title of this chapter is: “Start By Discarding All At Once, Intensely and Completely.” By not first discarding, you think you have cleaned up but then things accumulate, you collect more things, and then the space reverts back to its previous state. You must do a clean sweep. Conventional wisdom tells people to organize bit by bit so as to not get overwhelmed – clean a little each day, go room-by-room, tackle a closet here and there, and eventually your home will be organized. But that doesn’t work. Kondo suggests organizing all at once (she proposes a 6-month period), and importantly, to tidy by category rather than location. Most people keep the same type of item in more than one place (I think I have three drawers with paper clips in them). Otherwise, it’s easy to “rebound” and revert to the same, disorganized state. She suggests using the following categories, in this order: clothes, books, papers, komono (Japanese word for miscellany), and then anything with sentimental value. I personally would lump books into the sentimental value category, but that’s me. Kondo emphasizes that we should not be choosing what we want to discard; rather, we should choose what we want to keep (love this). She suggests picking up each item, really – picking it up and holding it in your hands – and asking yourself if it brings you joy and purpose. This also allows you to appreciate and value your possessions. I love this one. Unlike a lot of cleaning and home organization methods, Kondo does not suggest that you run to an organization store and spend all your money on fancy closet organizers and personalized coat hangers. In fact, Kondo’s favorite organization tool is a shoe box – it’s a great size and costs nothing (except the shoes). She argues that when we simply pack things away, our space becomes cluttered and chaotic. In the chapter, “Storage experts are hoarders,” Kondo expands on why storage is a common booby trap when tidying your space. Putting things away creates the illusion that the clutter problem has been solved. This is an important one – designate a place for everything. And put it there! The reason every item must have a designated place is because the existence of an item without a home multiples the chances that your space will become cluttered again. It’s not a central point in the book, but it is a very useful one – how to fold properly! The traditional method of stacking clothes in a drawer is WRONG WRONG WRONG. The weight of the clothes on top of each other makes each garment wrinkly and prematurely worn: stacking is very hard on the items at the bottom. Kondo suggests folding clothes into perfect rectangles, then storing them standing up rather than laid flat. Further, keeping clothes in a drawer is more space-efficient than storing them in the closet. I put this point into action for my shirts, many of which I usually hang in the closet. I found that folding my shirts the way Kondo suggets, even the ones that are made out of a delicate, wrinkle-prone material, made the shirts still look nice and smooth. Further, I was also able to fit about a third more shirts in the drawer. The obvious drawback of the KonMari Method is that the organizational effort may be difficult for some folks. Although Kondo claims that her clients have had an exorbitant success rate with little to no rebound, I still think that the method takes some energy, every day, to employ, not withstanding the initial huge cleanup sweep. For example, Kondo suggests that women empty their purses every day (just not going to happen for me). She also takes all of her soaps out of the shower – shampoo bottles, bath gels, etc., after each use, dries them, and puts them in a drawer. That’s a bit much. I’m not one for self-help or home organizational books, however, Kondo has gotten so much press recently that I had to try it out. I like the fact that it challenges everything that you thought you knew about tidying. Her method makes a lot of sense and she is very convincing. Further, the book is a short, quick read, broken up into small chapters with bolded text and call-outs to drive home the main points. If you have issues with clutter (who doesn’t? ), her viewpoint is definitely worth a read. I found this book really helpful in getting rid of stuff! I’m still in the process of de-cluttering, but I’m trying to be more minimal by only keeping things that sparks joy. I love the way you broke down the major points of the book and I always love hearing your opinions! Great site! I look forward to reading more recommended books and seeing your travels, great pictures btw, your cats are too cute!